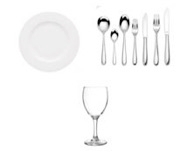 Here at Millie Miles we believe that attention to detail is vital and take great pride in ensuring that an order for ten place settings receives the same care and attention as one for three hundred. Which ranges are most commonly used? Clients love the Italian range of crockery as it is crisp and fresh. The Oxford range of cutlery, with its smooth edges and polished finish ensure that all the ‘yummy’ food on the plate can be eaten. To help wash all the food down, our Elegance range of glasses help complete the display on the table. When you hire from Millie Miles, you can be assured that all of our event hire equipment is of the highest quality, delivered spotlessly clean and ready to use. We also welcome any clients to come and see us if they have any queries or would like to have a look at any of our equipment prior to placing your order. Our showroom is open Monday-Friday 9am-4:30pm. Where can I find these ranges? For more information on any of these ranges (and our other ranges!) check out the relevant sections on our site.